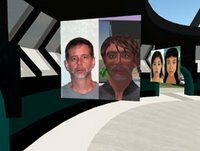 Here's another episode in the rise of the Metabrands as Cyberextruder comes to Second Life with a new über-cool Second Life service. One of the things I've noticed over the past months in Second Life is than many people are paying a lot of attention to their looks, some painstakingly tweaking their face until it does resemble their real life appearance. 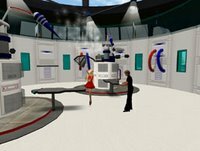 Here's the island which has the main Laboratory and some free vendor sites for related avatar business, one of them is Cryogen Labs where you can pimp the rest of your avatar. Well, mighty thanks to 57 who organised a trip to Avatar Island for the Things To Do group and got us free surgery (normal price at about l$ 2400, so close to 10 US dollar). In normal plastics you're face swells up, gets bloody and messy and you're absolutely not allowed to laugh, talk cry, shout get angry or whatever. 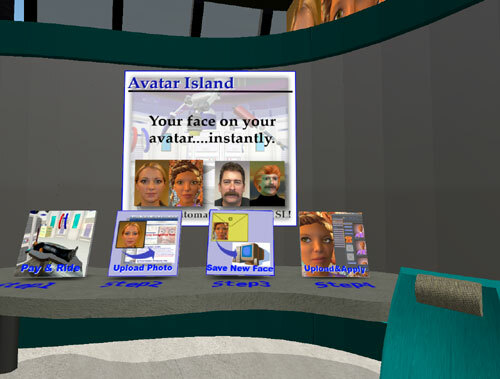 At Cyberextruders'nothing went really wrong, except SL went haywire, constant client crashes and forced client updates didn't really better my mood, so I barely dared look in the mirror. 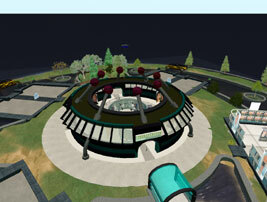 Okay, SL is quite buggy'right now and is taking huge amounts of memory so I won't get into the report on my face job. That will have to wait until tomorrow. Any idea who build this?